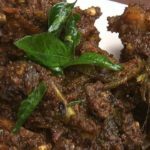 This pan-roasted mutton fry is very tasty and very delicious snack or a side dish. This recipe is prepared by cooking tender goat meat in caramelized onions, ginger, garlic and other spices. 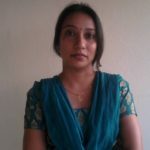 Find the complete instructions how to prepare easy mutton fry recipe. Firstly, clean and wash the mutton pieces and put them in pressure cooker. Then add 1 teaspoon ginger paste, 1 teaspoon garlic paste and salt to taste into it. Now add enough water up to the level of mutton pieces and mix well. Cover the lid with weight of pressure cooker and put over low flame and cook till 5-6 whistles or till mutton turns tender. Switch off the heat and let the pressure release. When the pressure gets released, separate mutton pieces from mutton stock. To do so take a deep large pan or a bowl and place a large strainer over it. Pour mutton pieces with mutton stock over the strainer to collect the mutton stock at bottom. Keep both mutton pieces and mutton stock in separate bowl. We will need both to cook this recipe. Heat a non stick pan over low flame and dry roast fennel seeds and grind it into coarse powder. Keep it aside we will use it later. On the same non stick pan add 6 tablespoon of oil and put it over medium flame. When the oil is sufficiently warm add the sliced onions. Fry them till the onions become translucent. Combine curry leaves along with split green chilies into it and sauté for a minute. Then add chopped tomatoes and fry till tomatoes get soft and mushy. Add the mutton pieces, half teaspoon turmeric powder, red chili powder, coriander powder, black pepper powder and fry them for 2-3 minutes till spices get fried well. When the the spices get fried and dry, add some mutton stock and salt to it. Fry them till all the juices get absorbed and the pieces get cooked a little. Once the water gets reduced add some more mutton stock and fry again adding rosted fennel seeds powder and garam masala powder cook further till all the water dries out and oil starts spareating. Now add some chopped fresh coriander leaves. Cook for a minute and remove it from heat. 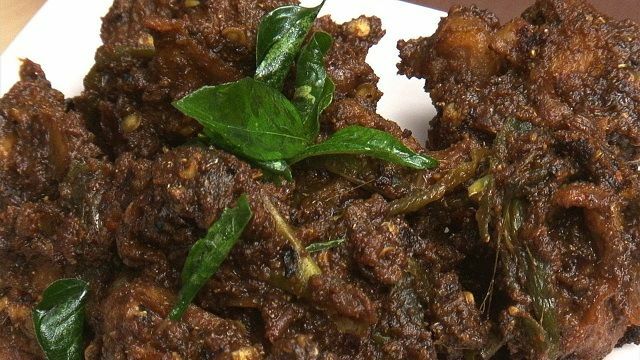 Your mutton fry recipe is ready to serve hot.